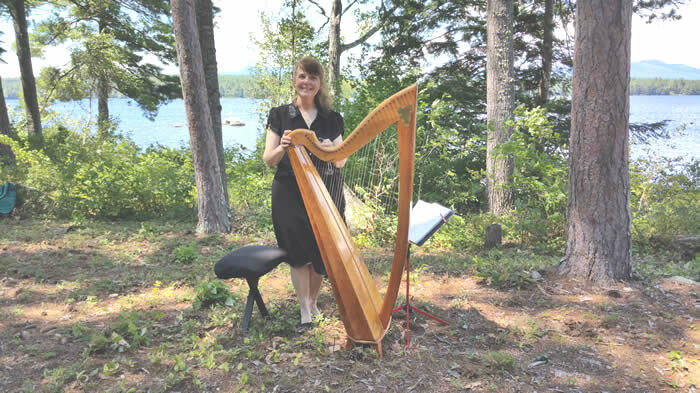 My harp is here ready to play for a wedding at Castle in the Clouds, Moultonborough, NH. 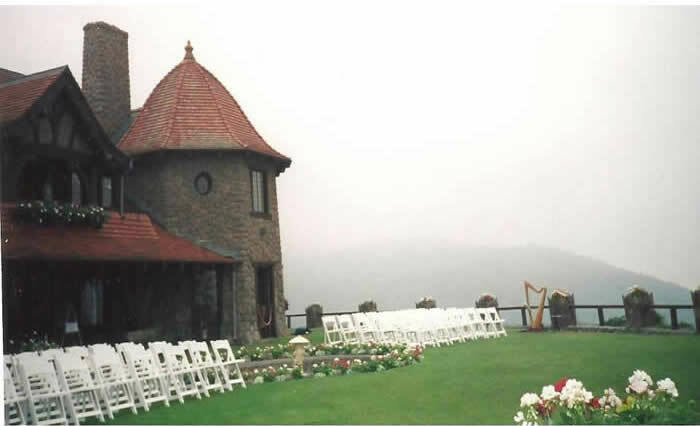 Then for two glorious weddings at The Omni Mt. Washington at Bretton Woods, NH. Jon is no longer available for bagpipe weddings. for those who are interested in the repertoire of the bagpipes and for getting ideas. The NH Scot Society maybe able to refer you to a current bagpipe performer. Here is a beautiful letter of thanks that I recently received and I just want to share with you. 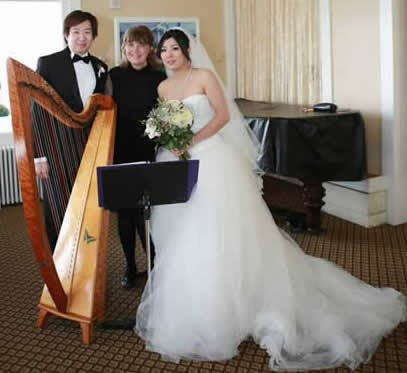 "I just wanted to thank you again for the beautiful music you provided for my son's wedding. Honestly, you made the whole process very easy. What an excellent idea to produce a wedding CD! entire process. Jane your harp and vocals were exquisitely beautiful, truly magical. The wedding Mass was everything we hoped it would be. with a Pillar at the front and evoking an elegant atmosphere. is slightly smaller and is more rounded but still has a beautiful harp sound! 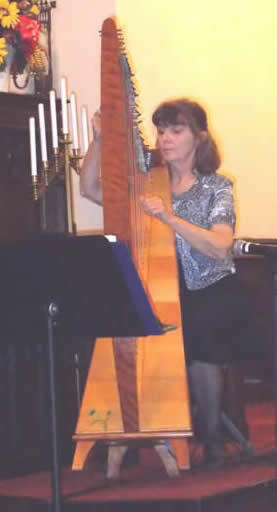 Pictured here: Jane is playing her Celtic harp at a recent concert . 1. 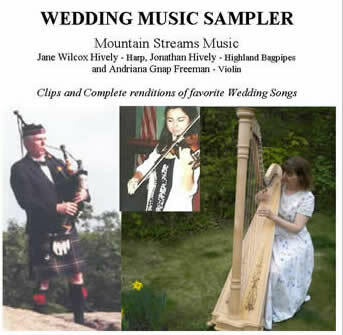 Request our FREE "Wedding Sampler Package with Brochure & Audition CD"
when you contact us by email or phone. 2. Check out Rates below and then call us to see if your date is still available. 3. Send 50% deposit or full payment to hold the date. Final payment is due at least two weeks before occasion. Please do not pay for any option below until you have spoken or emailed Jane about your date. If you are interested in the harp-violin combo, I have two people to make certain that dates are OK.
after which I will send a Receipt-Contract. incidental music during ceremony, Postlude as guests depart. Ceremonies are normally approximately one hour. If your ceremony is considerably longer there may be additional pricing. Please call to discuss your ideas. Call/email to discuss your budget. Please note: I do not play outside in the rain or even "threatening to rain" because this can seriously damage the harp. Also, if I am situated in an open space without shade of tree and in case of possible rain, please provide a canopy. Direct intense, sunlight can put the harp out of tune and again be damaging to the instrument. A little forethought such as positioning me on a porch or within a covered area will provide best results. 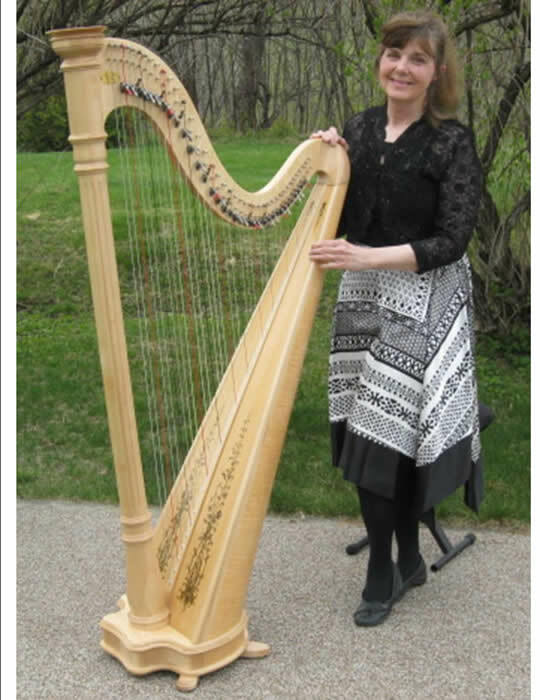 Be sure to indicate your style of harp: Classical or Celtic in an email to us! Jon has a busy schedule, so talk to him directly to arrange any bagpipe or musical ideas with him. "Thank you so very much for your incredible gift of talent for our wedding!! "Thank you for your beautiful music. The bride expressed her appreciation and said it was exactly what she had wanted. plenty of time and can give CDs or sheet music if we are unfamiliar with the song. Pick up some our recommended CDs to help you get musical ideas! 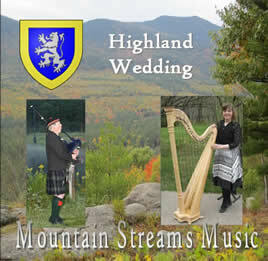 The Lord's Prayer, O'Carolan's Concerto, Scotland the Brave, The Irish Wedding Song...more!" O'Carolan tunes, Rorate, Originals, Thistle-Down and more! 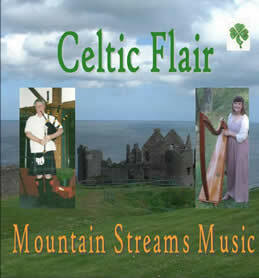 "Skye Boat Song, Scotland the Brave, Amazing Grace, Flowers of the Forest, A Hundred Pipers, Downtown....more! For the Beauty of the Earth, Jerusalem...more!" please add $3.00 S&H for one CD or $6.00 for more than one. We welcome..personal check, money order and cash.